No more heavy lifting to move your favorite planter to a new location. With this 11.5" round planter caddie, move your plants with ease with four independent wheels. The all rustic wood finish will look great with any decor. You can easily display your prized potted plants on any patio, living room, office or porch. 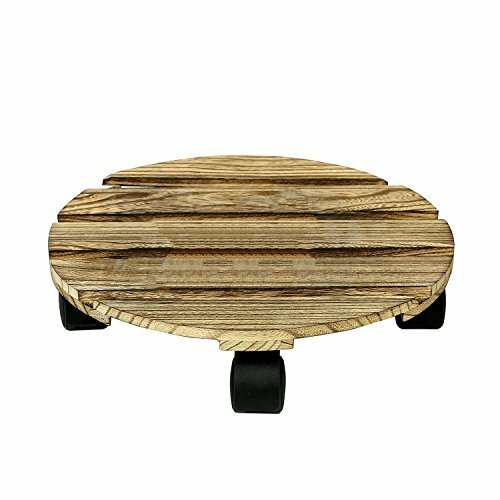 Approximate Dimensions (in inches): 2.75 H X 11.75 W X 11.75 D.
11.5'' round rolling planter caddy with rustic wooden finish. Ideal for indoor and outdoor use of any potted plant or gardening tools. Four durable independent wheels makes maneuvering a breeze.